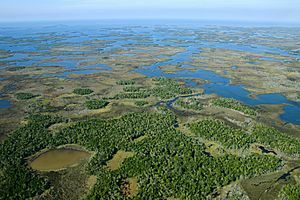 The 30,843 acres (124.82 km2) Chassahowitzka National Wildlife Refuge is part of the United States National Wildlife Refuge System, located on the west coast of Florida, about 70 miles (110 km) north of St. Petersburg. It is famous as the southern wintering site for the re-introduced eastern population of whooping cranes. The Chassahowitzka Wilderness Area is part of the refuge, and consists of 23,578.93 acres (95.4205 km2) or 76.4% of its total area. Only a portion in the northeast is not designated as Wilderness. In 2001, the Whooping Crane Eastern Partnership raised whooping crane (Grus americana) chicks in Wisconsin's Necedah National Wildlife Refuge then guided them to the Chassahowitzka NWR for the winter. Despite severe mortality from hurricanes in 2007, the re-introduction has been successful and by 2010 there were up to 105 migrating birds established in the eastern United States for the first time in over 100 years. Chassahowitzka National Wildlife Refuge Facts for Kids. Kiddle Encyclopedia.